In addition, through the promotion of afforestation and reforestation, improved forest management, and green building and furnishing, the SFO concept further emphasizes the role of wood as a renewable and environmentally friendly material. Improving safety and ergonomics for forest operators. 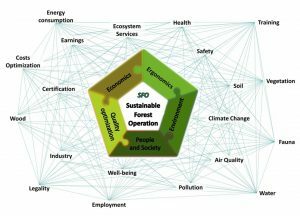 “The innovation behind this new paradigm of SFO is the integrated approach to forest operations,” said Prof Enrico Marchi, of the Department of Agriculture, Food and Forestry Systems at the University of Florence, Italy, and one of the study’s authors. “It aims at reconciling bio-economy, environmental ecology, human factors and society and different scale levels. The five key, interrelated, performance areas necessary to ensure the sustainability of forest operations – environment; ergonomics; economics; quality optimization of products and production; and people and society – “are quite obvious, if you consider them singularly. The real challenge is to find a balance among the performance areas, addressing each of them without negatively affecting the others,” said Prof. Marchi. “It is workable around the world. Each country, depending on its own socio-economic condition, legislation, needs and management objectives, could apply the principles of SFO to find the best way for them to address the sustainable development approach in forest operations,” he said. “Actually, good policies should be applied in order to decrease costs for forest enterprises, because more profitable activity means a higher capacity for businesses to invest in safer machines, healthier equipment and low-impact operations,” said Prof. Marchi. “Everyone with a stake in wood production, environmental protection, forest-related tourism, forest workers associations, etc., will benefit from SFO. But, in the end, forests are a benefit to everyone. So a correct implementation of SFO principles will, in the long run, benefit everyone,” he said.